These Fellowes premium self adhesive laminating sheets are ideal for protecting important documents that are sensitive to heat. They are also an excellent choice for individuals who don't have a laminator. Self Adhesive laminating sheets (sometimes called Cold Laminating sheets) can be used to protect concert ticket stubs, ultrasound pictures or other thermally printed documents. Choose from letter size laminating sheets that can be cut to virtually any size or a laminating roll to protect longer documents and posters. Simply peel off the adhesive backing and carefully stick the laminate to the item that you need to protect. These laminating sheets can be used without a laminator and can be trimmed to accommodate virtually any size of document or item..
Great product. Cut to size and customizable. This is a convenient product and an item that I have used frequently in the past. Great for saving those family articles. Peel backing, lay out film with sticky side up, make certain it's flat, and then carefully put item to be laminated on it face down, center first, then edges. I've used numerous rolls of this stuff, and am quite satisfied with it. Welcome to MyBinding Video. 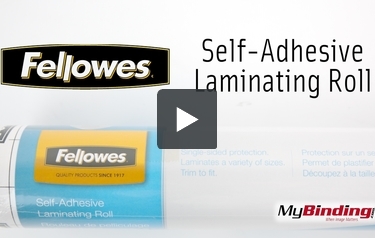 This is the 16”x10’ 3mil Self Adhesive Laminating Roll from Fellowes. These premium laminating sheets are ideal for protecting documents and prints that are sensitive to heat. Use scissors or a cutting table to cut off an appropriate size piece for your document, two if you’d like to laminate both sides. It can be some trouble keeping the sheets flat, just remember to lie them down with the liner side up. After the liner is removed, place your document face down onto the adhesive. Repeat for the back side, then trim the edges as you’d like. First try and it wasn’t a half bad job. These rolls are available individually. For more videos and all your binding needs, visit MyBinding.com.